Imagine the kitchen of your dreams. The floors, counter tops, and cabinets all compliment each other in their beautiful detail to create a kitchen you could live in. There is only one aspect that can make it or break it, and that is lighting. Create space when doing your kitchen remodeling by removing outdated fluorescent lighting that can drain the energy and money out of your house, and consider replacing it with LED Recessed Lighting. 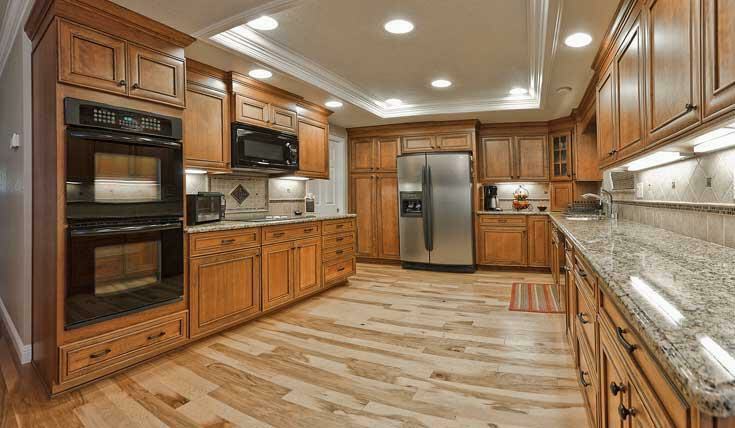 LED lights provide a wider spectrum of light that highlights and captures the beauty of your counter tops and floors. In addition to being visually stimulating, LED lighting opens up the range of light in your kitchen to help illuminate the deep recesses of your cabinets, which means saving time finding items in your pantry and shelves. LED lights are highly energy efficient, and burn at a lower temperature which helps reduce the heat factor from cooking and baking. Fast, easy, affordable, and always reliable, AAA Bishop Electric is highly experienced in installing innovative LED Recessed Canned Lighting for your kitchen remodeling. AAA Bishop’s 25 years of service has given us the opportunity to see and experience lighting trends evolve. We are now on the forefront of lighting technology. LED Recessed Canned Lights are replacing outdated canned lighting using older incandescent bulbs. Older contractor grade ceiling trims with halogen or incandescent bulbs can be retrofitted with state of the art LED bulbs. With the perfect lighting spectrum, you can completely revolutionize the look and feel of your bathroom.